For this sweet treat, you will need an ice cream maker. You can use this custard-based vanilla ice cream recipe for the base or make your own recipe. 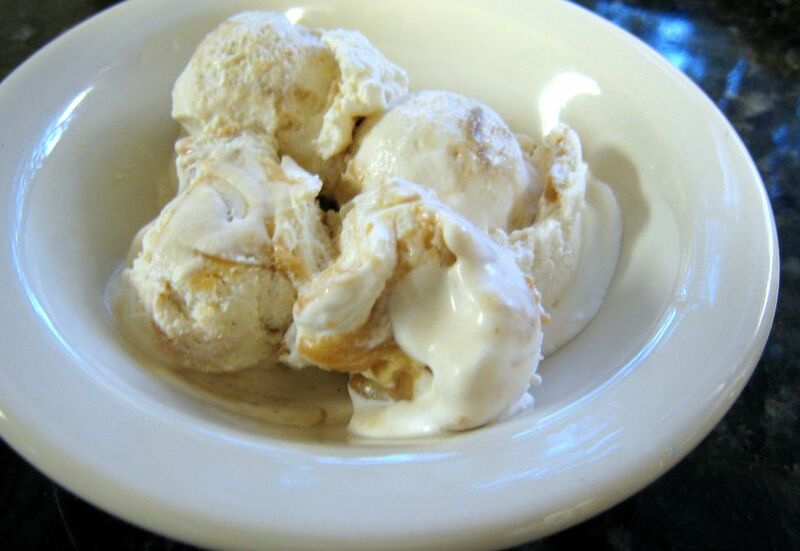 Then swirl in the peanut butter sauce for a wonderful frozen treat. Combine cream, milk, and sugar in a heavy saucepan. Heat over medium-low heat, stirring frequently, until the sugar is dissolved and the mixture is hot. Pour about 1 cup of the hot mixture into the beaten egg yolks, whisking constantly. Pour the egg mixture back into the saucepan, whisking constantly. Cook over medium heat, stirring constantly, until the hot mixture is slightly thickened and coats the back of a spoon, about 6 minutes. Do not let this mixture boil. Strain through a mesh strainer into a bowl and stir in the vanilla. Cover and chill thoroughly. Freeze according to ice cream maker's instructions. Combine the peanut butter, 1/2 cup whipping cream, 2 tablespoons corn syrup, and the 1/4 cup of brown sugar in a saucepan. Heat over low heat, stirring, until smooth and sugar is dissolved. Chill thoroughly. Pack the finished ice cream into a container, alternating with spoonfuls of the peanut butter mixture; swirl lightly with a knife. Freeze until the mixture is solid. Save extra peanut butter sauce to use for warmed topping.